Seasonal Occurrence: Common fall through spring; occasional in summer. 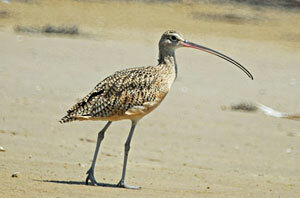 Notes: The Long-billed Curlew is the largest shorebird in North America. This speckled brown and buff colored bird’s most noticeable feature is it’s extremely long down-curved bill. Their bills can reach 8 inches or more and are dark in color and fade to flesh tones at the base. Their underwings are cinnamon in color and their legs and feet are bluish-gray. The Long-billed Curlew spends the non-breeding months along the coast, but in summer they are found in the Great Plains and Great Basin in areas with sparse, short grasses, such as mixed-grass prairies and agricultural fields. Here they feed on mainly insects such as beetles, grasshoppers, and caterpillars. They will also eat spiders, toads, and berries. On the breeding grounds, the Long-billed Curlew males will do an undulating flight display over his territory while giving a loud ringing call. Once he has a mate they will construct a nest in a shallow scrape in the ground. The pair will create a lining for the nest of about 8 inches across and 3 inches deep with pebbles, bark, animal droppings, grass, stems, twigs, and seeds. Their clutch averages 4 eggs and both adults will incubate until they hatch, approximately 27-30 days. The downy young leave the nest soon after hatching and can feed themselves. Both parents will guard the young as they forage in marshy or damp areas. Long-billed Curlews migrate to the coast in winter and can be found in the southern United States as well as northern Mexico. During winter, they can be found in coastal prairies, wetlands, tidal estuaries, mudflats, flooded fields, and occasionally beaches. While in these coastal areas the Long-billed Curlew will also eat crabs, crayfish, mollusks, marine worms, and ghost shrimps. Long-Billed Curlew are seen along the coast of Texas as they either pass through or arrive for winter. If you visit the Bolivar Flats Shorebird Sanctuary there is a good chance you’ll find one foraging among the thousands of other shorebirds currently staging or wintering there!